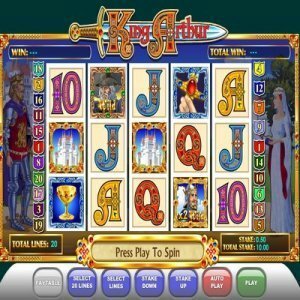 [miau] King Arthur is a reminiscent game where the players are taken back to the ages of kings. The game revolves around King Arthur and his knights. Actually the setting appears kind of ancient due to the way the king and the knights are arranged. What makes it so interesting is the type of adventure involved therein. It induces a feeling that one is living in those ages while trying to offer some sense of beauty from the visuals to the amazing sounds. This is not all, there is more about King Arthur that you may need to learn. Read on to get more information about the game. Playing King Arthur offers you two bonus options: you can activate the first after receiving not less than three of the ‘Camelot’ symbols on an active payline beginning from the left side. Immediately this executed, you are now taken to a new window which displays roads with a map that directs you to different doors in the Camelot. Each door gives a specific multiplier. You make several choices which later lead you to a single door and at this point you will get to win based on the multiplier applied in that case. Note that if you happen to land in a door with a x0 multiplier, you will lose every point gained in the bonus session. The second feature becomes active after receiving more than three ‘Sword in the Stone’ symbols anywhere in the reels. Upon this happening, the Arthur tries to pull the swords from the stones. In each that he manages to pull out then you get to win some points because the multiplier is applied. King Arthur has two wild symbols. The first being the knight symbol which works by substituting for other icons. The second symbol is the peasant symbol, although it does not function as a multiplier, it only acts as a wild icon. As seen above, King Arthur is an amazing game that any adventurous player cannot afford to miss. Actually, it is worth playing more than once because of the reminiscent touch it bears.